A mile from Northern Kentucky’s bustling Newport on the Levee is Christopher’s Bed and Breakfast, a ravishing 19th century former church that sparkles with jewel-toned stained-glass windows, three sumptuous Jacuzzi suites and sits grandly in the heart of the Bellevue historic district, Taylor’s Daughters, in honor of General James Taylor. Located just three blocks from Newport on the Levee, this Holiday Inn Express Hotel near Cincinnati offers you convenient access to the Newport Aquarium and the Levee itself. You can go shopping, see a movie or check out one of the many restaurants on the Levee. Also nearby is BB Riverboats, which offers a variety of different cruises on the Ohio River. From these riverboats, you can see the Cincinnati skyline while enjoying good food and music. For sports fans, you can enjoy a nearby Cincinnati Reds baseball game or a Cincinnati Bengals football game. You'll enjoy staying in these 1880's side-by-side Victorian Gothic homes with period pieces as well as today's modern furnishings and amenities. 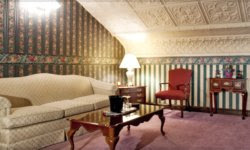 Business travelers and leisure travelers will find everything needed for their comfort within their private suite. Our Event Center provides the perfect setting for a gathering of friends, family or colleagues. Conference style seating and a hospitality suite help create a unique getaway.